I recently bought the new Lie-Nielsen Honing Guide. Along with the Honing Guide I also bought two of the seven additional sets of jaws designed for this guide. These jaws increase its functionality, beyond the included “main” jaw set, for Lie-Nielsen’s blades and chisels. 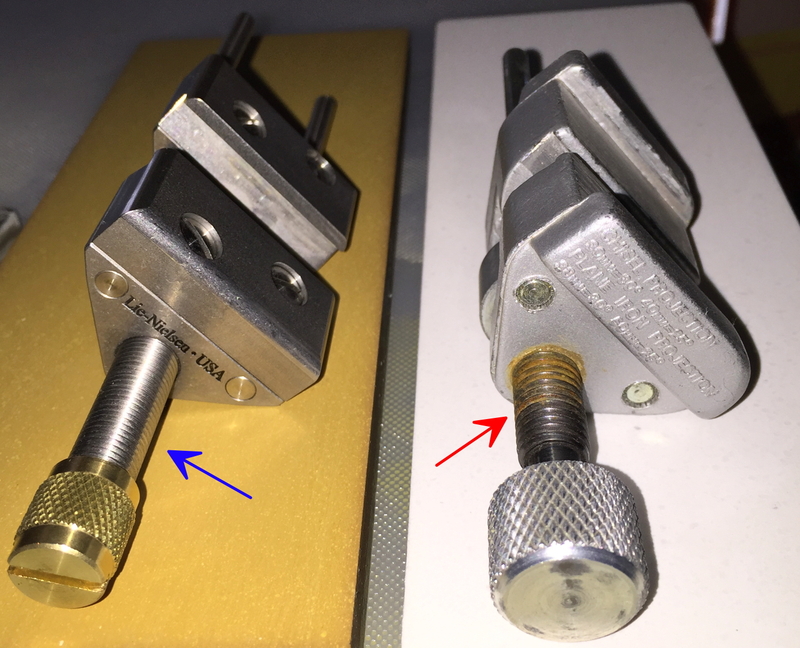 There is a disclaimer that lets one know that if it isn’t a Lie-Nielsen tool then they don’t guarantee the Honing Guide will necessarily work, but after a very limited test with “other (read non-Lie-Nielsen) chisels and blades in my kit, so far so good (for specifics, see last main paragraph). Ok, so lets get into the meat of this article, which is the actual Honing Guide, and what makes it different. 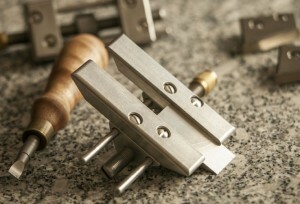 The Honing Guide is machined from stainless steel, has a bronze bearing and brass nut. 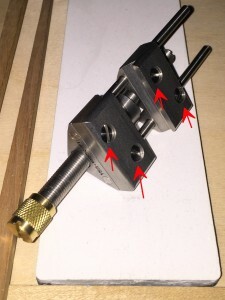 The precision and materials lift this up to an extremely high level, and since you can disassemble the guide into its basic pieces, you can replace any piece if it happens to foul somewhere in the future. This may seem like no big deal, but this really does present the owner with the ability to easily keep it working throughout their woodworking life, and then pass it down to future generations. 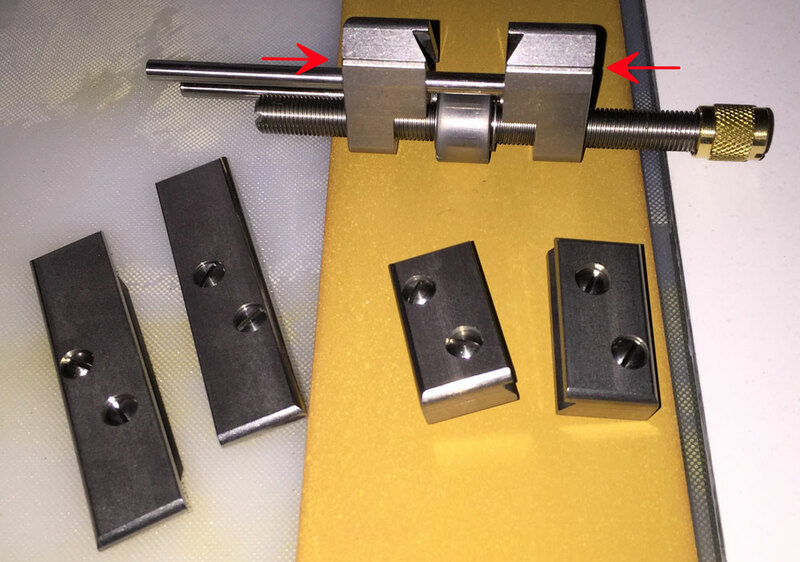 The jaws on this Honing Guide are made so you can easily remove them and then attach another set of jaws in their place, specific for certain Lie-Nielsen tool blades or chisels, while retaining perfect alignment. Guide (red arrows identify the current jaws) with extra jaws. Red arrows are pointing to the captured attachment screws on each jaw. The set of jaws that comes with the Honing Guide will cover a wide range of their core tools, from most of the plane’s (bench, low-angle bevel-up and most block planes) blades/irons to 1/4” – 3/4” bevel edged chisels. I bought the Chisel Jaw set, which handles the 1/8”, 3/16” – 3/4” range of bevel edged chisels, as well as their Long Jaw set. The Long Jaw set handles their spokeshave blades, shoulder plane blades, #610, #10 ¼, #85 and the attachment screws are offset towards one end, providing up to 30-degrees with the jaws facing one direction, and up to 40-degrees with them in the opposite orientation. 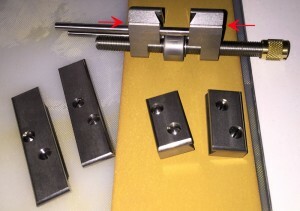 In addition to these, there is a Mortise Chisel jaw set, a 30-degree skewed jaw set (this type of jaw set is offered separately in both left and right to handle blades/irons for their #98/99 side-rabbet planes), and an 18-degree skewed jaw set (also offered separately in both left and right for their #140 Skew block planes). I made a Honing Board for this new Honing Guide, as its dimensions are different from the ubiquitous “Eclipse-style” guides, so the distance for each stop is also different. Lie-Nielsen vs. Old Record (Eclipse style). The Honing Guide is packaged in a small clear plastic case, which has very little extra room but luckily there is just enough to fit a small information guide that has the stop-distance information (provided in both Imperial and Metric) for 20-degrees up to 50-degrees. So far I have honed a number of Lie-Nielsen tools, starting with the blade for the #8 (don’t worry, it really does open wide enough to securely hold this giant blade), #62, #60 ½, #102, and the 3/4” Bevel Edged Chisel. 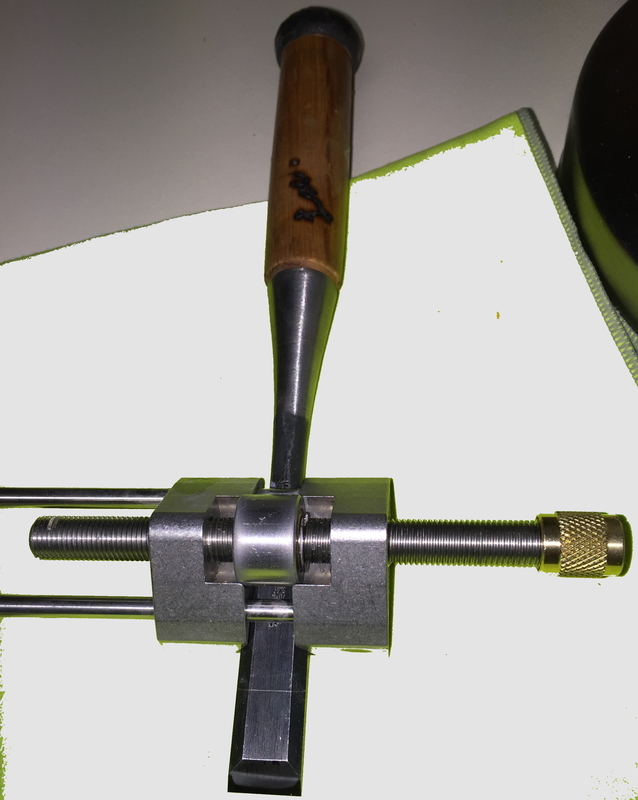 The knurling Lie-Nielsen used on the Honing Guide’s brass nut (what you turn to tighten or loosen the guide’s grip on a tool), transmits the twisting energy quite well, while still feeling comfortable to your hand(s). Oh, and your fingers really are what you should use to tighten the Honing Guide for any blade/chisel. 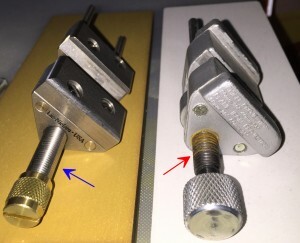 The deep-cut groove in the brass nut’s end (as well as the opposite end of the threaded shaft) is only there to assist in removing the brass nut, which is required to completely disassemble the Honing Guide. 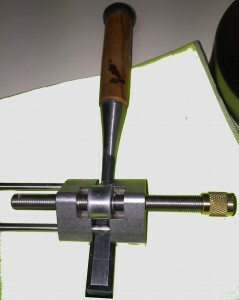 Tested tools with the Honing Guide. I mentioned earlier that I also tested this Honing Guide on some “un-confirmed blades” and one last item that totally amazed me. The blades I tested were from an old Stanley #6 and #3, which really doesn’t have anything about them that would suggest they wouldn’t work, but they needed honing. As expected these worked wonderfully in the new guide. The last item I tested was a hand-made Japanese chisel that I bought when I was over in Japan in 2001. This chisel has what I call a standard profile, which means it has thick, square-edged sidewalls, as compared to a dovetailed style (triangular-shaped cross-section that some honing guides handle easier). I hone this type of chisel in the traditional manner, so it has one large bevel (read that as no micro-bevels), as the experts believe this provides the best edge as well as support to limit chipping of the hard-steel layer. I confirmed this chisel presented squarely from the guide and there was adequate projection to match the existing bevel. This worked beautifully and produced exactly what I expected: an incredibly sharp chisel. To be clear, this is just one of many Japanese tool brands and I’m in no way saying this guide will work for all Japanese tools! This guide worked great on what I personally tested, and there is at least hope that other tools may fair similarly. I hope you enjoyed the article, and thank you for checking it out. Please let me know if you have any questions or comments. Find out more information or purchase the Lie-Nielsen Honing Guide at Highland Woodworking. Reflecting On Resawing Get WoodWorking Week 2016: Join Us!